The provision of food was very important to the poets. Foods of all kinds are mentioned, including bread, different cuts of meat, various vegetables and fruits, as well as spices and herbs. The poets also highlight how much food is served at a feast. 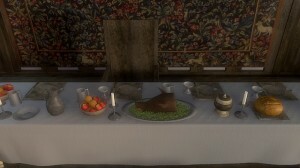 There would be several different meals or courses, as shown on the table at Cochwillan (see Recreating Cochwillan). A word frequently used in the poetry for a plateful of food or a course within the feast is saig or seigiau. The word ansodd or ansawdd is also used in the same way, sometimes meaning ‘feast’, generally, or sometimes, more specifically, the delicacies of the feast. Saith gwrs a welais i’th gog. I saw seven courses by your cook. : For a more detailed discussion, see A.M. Edwards, ‘“Food and Wine for all the World”: Food and Drink in Fifteenth-century Poetry’, in D.F. Evans, B.J. Lewis and A. Parry Owen (eds), ‘Gwalch Cywyddau Gwŷr’: Essays on Guto’r Glyn and Fifteenth-Century Wales (Aberystwyth, 2013).